Are you sick and tired of spending your hard-earned money every 10-15 years to replace your old and crumbling asphalt roof? Are you fed up with shingles that blow off, curl, and look plain awful? You’re not alone. We promise. Syracuse Metal Roofing has installed hundreds of steel, slate, metal roofs for homes, commercial businesses, industrial buildings, and other dwellings across Central New York state. We hear a common theme among our satisfied customers. They desire a roof that looks great, is low maintenance, will stand the test of time, saves money, and adds value to their property. We take roofs seriously. After all, they protect your entire investment – whether it be a home, business, or some other structure – plus those inside. What sets us apart from other roofers and roofing contractors in the Syracuse area is that we are experts in the metal roof installation niche. It is what we do. If you’re thinking about making an investment in a metal roof for your home or business, start by calling Syracuse Metal Roofing for a free consultation and estimate. We offer upfront pricing and financing options that make metal roofs a reality for all budgets. Think about it. While a metal roof may cost 2-3 times more than a traditional shingle roof up front, you’ll enjoy a huge savings over your neighbor who will have to replace his asphalt roof every 10-15 years. If you purchase a metal roof to replace your existing roof or even for a new home, it will likely remain in good shape long after you’ve moved on. Many of the materials we use – from steel to coatings – have lifetime warranties that can be passed on to the next owner. With our metals roofs, you can essentially set it and forget it. You won’t have to worry about shingles splitting, blowing off, or curling. Just sit back, relax, and enjoy your beautiful roof and home. Not only can metal roofs stand up to heavy winds, hurricanes, hail and snow, they are also durable in the sun and heat. They reflect sunlight, keeping your home cool in the summer, and resist heat that breaks down asphalt shingles. Even if you don’t plan on staying at your home for long, a metal roof will help it sell for more. Metal roof installation delivers a 60 percent return on investment – better than or equal to bath, kitchen, deck and window upgrades. Why choose Syracuse Metal Roofing? We know you are many options when it comes to care for your roof. Many roofers in Syracuse are very good at what they do. Some even have decent reviews on Yelp, Angie’s List, Google, Thumbtack, Facebook, and Home Advisor. But, you know what? They just don’t stack up to the craftsmanship, professionalism and friendly customer service of Syracuse Metal Roofing. Why choose us for your metal roof installation? Keep on reading. We specialize in metal roof installation, and we are experts in the field. You’ll find other roofing companies in Central New York that offer metal roofing installs, but it is just a small part of what they do. Metal roofs are our thing. Don’t you want quality service from the best? 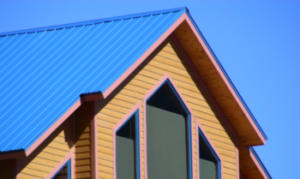 What will your metal roof cost? We’ll provide a free and accurate estimate and stick to that price tag. No curve balls. No hidden costs. We’ll tell you a metal roof will cost twice as much or more than a traditional roof. We’ll also show you why they do and help you understand the true value of protecting your home with metal roof. We’ve all been there. Totally frustrated by the service company that doesn’t pick up the phone or call you back … or who shows up late, or doesn’t show up at all. That’s not us. We’re responsive. We show up on time. We keep you update on your project. And we’re always happy to answer your questions with a smile. With us, you have options. 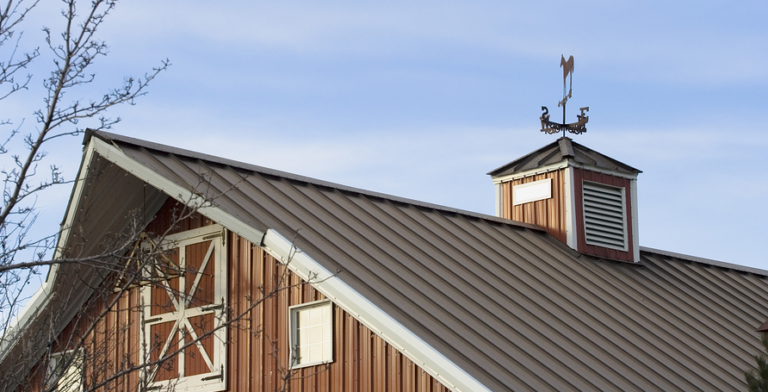 The cost of metal roofs vary depending on material, thickness, coatings, and special features. Though all are sturdy and backed by long or lifetime warranties, we are pleased to show you choices that are best for your budget and your style. With financing available, a strong, reliable, and eye-catching metal roof is a possibility for all homeowners and commercial businesses. We only use the strongest materials and coatings on our metal roof installations. Choose from steel, aluminum, copper and more. Almost all are backed by lifetime warranties that can be passed to the next owner. Sure, you might be able to find cheaper metal materials at the local home improvement chain (Home Depot, Lowe’s, etc. ), or from Joe roofer, but you get what you pay for … which are flimsy materials that won’t last and will cost you more in the long run. If you’re researching metal roofs for your home or commercial business for the first time, you might not know the wide range of choices when it comes to materials, look, and strength. 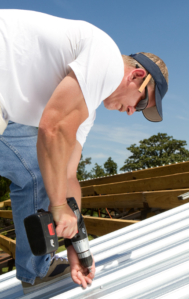 Our metal roofing contractors have the knowledge and expertise to install all types of metal roofs. We can help you choose an option that fits your needs, style, and budget. Maintenance free, elegant, yet rugged, metal shingles add value to home. They are defined by deep grooves and lines (and carry the same beauty and color as wood shingles), and can stand up to hurricane winds. Similar to metal shingles, steel can be painted and coated to the color of your choice. These shingles offer beauty, style, and dynamic curb appeal. Slate can stand up to winds of 150 mph and more. These roofs are ideal for the wind snow, hail, and other rough weather we get in Syracuse. Slate often carries a lifetime warranty. These long panels are popular for log cabins, cottages, farmhouses and industrial and commercial buildings. Available in a variety of colors, these panels are often installed with metal shingles as an accent piece. We also carry and install copper and aluminum roofing materials. Still not convinced? Call Syracuse Metal Roofing today at 315-800-5716 and one of our courteous and professional representatives will set up an appointment for a free consultation and estimate. We will build a plan and schedule for your project and give you options in terms of pricing and style. Stop wasting your hard-earned money on roofs that don’t last and only cause you frustration. Count on us to build you a metal replacement roof that will stand the test of time. We serve the great people of Syracuse, Cicero, Clay, Baldwinsville, Liverpool, Baldwinsville, Aurburn, Fulton, Cortland, Ithaca, Oswego, and other communities in Central New York.